For an electronic PDF version of the newsletter, download below. It’s not just homework help at our After School Program! On Thursday, Sept. 20th we celebrated our children who had birthdays this summer! It’s never too late to celebrate!! Join us in wishing them a Happy Belated Birthday! Many thanks to the @HighlandStreet Highland Hitters for giving some of our ESOL students the chance to watch a Red Sox game at Fenway! It was a great game, and we got to see a home team victory. What a treat! Casserly House celebrated our newest U.S. citizen this week - Sadaka! Sadaka and her two sons passed their citizenship tests and will be sworn in in early September. Please join us in congratulating Sadaka! Just a friendly reminder to all our neighbors and friends that Casserly House is back from Summer vacation! ESOL classes have resumed!! Well friends, it is that time of year when Casserly House goes on Summer Break for 2 weeks! We will be opening our doors again on Tuesday, August 14th! In the meantime, everyone enjoy these warm summer days! On Friday, July 27th Casserly House was excited to once again return to the baseball diamond to play in the annual Cops vs Kids softball game with our friends at BPD District E-5. We enjoyed a friendly game and a delicious BBQ after! Pictures are worth a thousands words...check out our album! 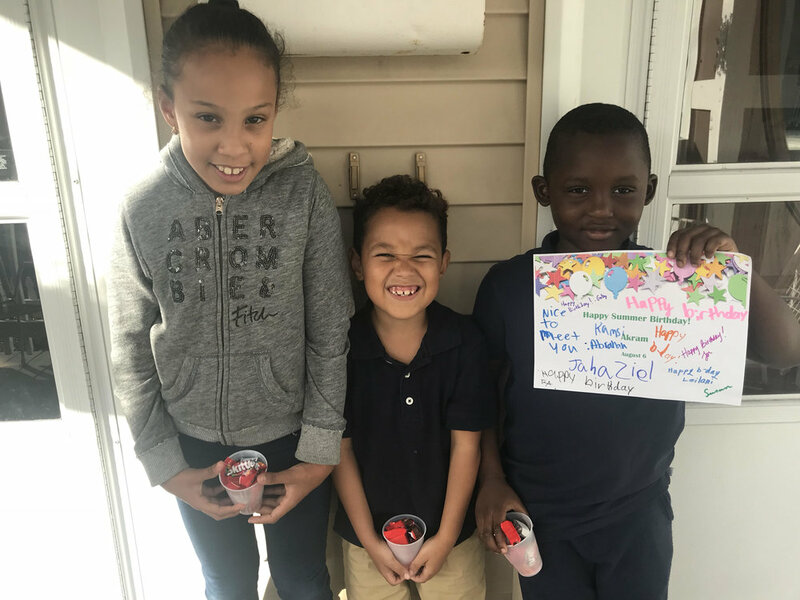 Sunday was Casserly House's Annual Driveway picnic where students, staff, and neighbors came to celebrate another year of learning and community. Along with our students, who came to celebrate their hard work in both ESOL classes and After School support, we want to say a special thank you to the E5 BPD who supplied an ice cream truck, Jason Stone Law who donated bike helmets, Davey the Clown who provided tons of laughs, and State Representative Liz Malia who came out to join in the celebration. We are so grateful for our wonderful community who allow us to learn and love all year! Former JV Brian Ahern returns for a visit! Casserly House had a special visitor today! Former After School Coordinator Brian Ahern (2009-2010) came back to visit us today and say hello to our morning students! Also stopping in for the mini-reunion was Jim McCarthy (former IVC and staff member at Casserly House) and founder of Casserly House, our very own Sr. Nancy! All enjoyed a wonderful visit! We hope you come back and visit us again soon Brian! The annual Love Your Block was Saturday, May 19th and it was a success! Members of the Roslindale community met at Chua Vietnam Temple and worked together to clean up the surrounding street, sidewalks, and trails. Thanks to everyone who came out to help! ASP Volunteer Martha donated plants and knowledge to help the Casserly kids start a garden! The students were not afraid to get their hands dirty (and even elected to dig for worms) while we planted sugar snap peas and strawberries. The kids are excited to help the plants grow! Last year's After School Coordinator, Breda stopped by Casserly House to say hello to our morning and afternoon students. Breda is currently teaching English in Chongqing and showed our students the long journey she took to Boston, shared some Chinesee Yuan currency, and showed us how to count in Mandirin. Come back soon, Breda! Learn more about the Bus Lane Pilot Program on Washington St! The Boston Transportation Department announced that, in partnership with the MBTA, the City of Boston will implement a four-week pilot program beginning Monday, May 7, to comprehensively test the effectiveness of a dedicated bus lane in Roslindale. Until Friday, June 1st, no parking will be allowed on the inbound side of Washington St. form Cummins Hwy to Forest Hills Station Monday through Friday from 5:00 AM until 9:00 AM to allow for a pilot bus lane during peak morning commuting hours. Vehicles parked on the inbound side during these hours will be towed. Casserly House morning students had the oppurtunity to meet with Mayor Walsh this morning when he stopped by Adam's Park in Roslindale Square. Thank you to Matt Lawlor from WalkUP Roslindale who came to Casserly today to speak to our adult learners about the proposed Arboretum Gateway Path! Be sure to click on WalkUP Roslindale and learn more about the proposal! Casserly House has been awarded a grant by Suffolk County District Attorney Dan Conley's office for our continued efforts in "keeping Suffolk County youth away from drugs, violence, and negative choices." This was the eighth year we have been awarded a grant, and we truly value the ongoing partnership with the DA's office. The grant will help us maintain and enhance our after-school program and summer educational camp. Thank you @DADanConley ! !